Virtualization is a power technology with diverse applications in high-performance systems. The adoption of virtualization in HPC systems can only occur, however, if it has minimal performance impact in the most demanding uses of the machines, specifically running the capability applications that motivate the acquisition of petascale and exascale systems. Virtualization cannot succeed in HPC systems unless the performance overheads are truly minimal and, importantly, that those overheads that do exist do not compound as the system and its applications scale up. The VEE Project, a collaboration between UNM, Northwestern, Pittsburgh, Sandia, and Oak Ridge developed the Palacios Virtual Machine monitor to provide scalable virtualization for HPC systems. 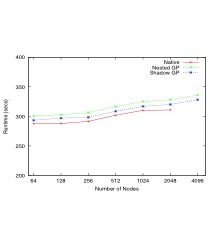 Palacios provides minimal-overhead virtualization for HPC systems, with less than 5% application performance overheads when running on large-scale Cray supercomputing systems. Building on these results, we have conducted a wide range of cutting edge HPC research described below. Research on the Palacios was funded by the U.S. Department of Energy Office of Science, Advanced Scientific Computing Research, under award number DE-SC0005050, program manager Sonia Sachs, and from grant CNS-0709168 and CNS-0707365 from the National Science Foundation.